This bright and spacious two bed, two bath home is currently undergoing a complete renovation! This is a sponsor sale, that does not require co-op board approval.Enter into a proper foyer that which leads to the spacious living and dining rooms with oversized windows. Your eye will be drawn to the stunning East VIEWS from the living room. Enjoy open city views and beautiful sunrise skies while overlooking Union Square Park. The oversized living area can easily accommodate living and office areas, while the dining alcove provides the perfect space to dine and entertain.The renovated windowed kitchen has two entrances to allow for easy access. Enjoy northern views of the Empire State Building from the large window in the kitchen. The kitchen will feature sleek custom white cabinetry, stainless steel appliances by Bosch, and beautiful caesarstone countertops. The two full bathrooms offer a clean, luxurious feel. Beautiful basketweave marble floor tiles are accented by classic white subway wall tiles. Storage is abundant both in the medicine cabinets and the vanities. 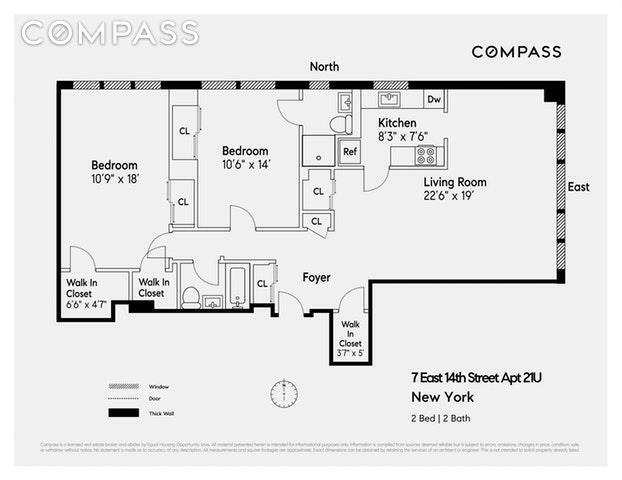 The two bedrooms each have multiple oversized closets and north facing open city views. Renovations are being completed from top-to-bottom, including new hardwood flooring throughout, beautiful base molding, and custom radiator covers. There are EIGHT closets throughout this apartment, including three walk-in.Live in the heart of Union Square, at the famed Victoria, a well-run co-op located at the nexus of the best neighborhoods in Manhattan. Located just a half block from Union Square, The Victoria is a full service Co-op building with 24-hour doorman and live-in super. Additional amenities include additional storage and bicycle storage for an additional fee, a spacious laundry room on the lobby level, in-house valet service, and a garage accessible from within the building. Being in the heart of Union Square, there are endless conveniences at your fingertips including the 4/5/6, N/R/Q, L trains and, M14 bus within half a block. Additional subway lines (F, 1) are within two blocks. There are some of the best grocery options in all of Manhattan, within a few blocks: Whole Foods, Trader Joe's, and Union Square Park's renowned Farmers Market. Great restaurant options and plentiful shopping are all around as well. The Victoria offers a full-service lifestyle in an extremely convenient location.SPONSOR UNIT, NO BOARD APPROVAL REQUIRED. Purchaser pays NYC and NY State transfer taxes and sponsor's attorney fees. Please inquire for more details. Listing courtesy of Nikki Adamo of Compass.